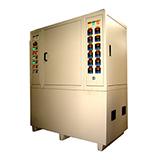 As a leading Capacitor Production Equipment manufacturer, we offer Thermal Press Machine suitable for various industries. Please feel free to contact us if you want to know more about Thermal Press Machine. As a customer-oriented company, we are more than happy to provide detailed information for you.